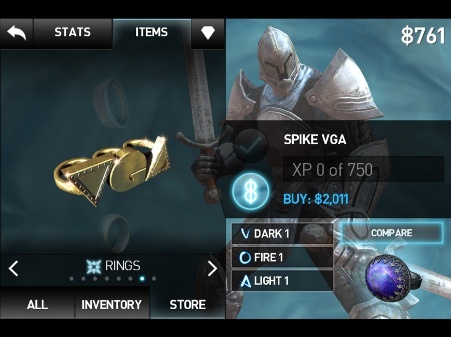 Infinity Blade 2's Spike VGA Ring: Cool, Or Corn Ball? See that fourth wall over there? It's about to come down. While scrolling through Infinity Blade 2's inventory of swords, shields and armor, we came upon this little guy. In case you're unaware, Spike VGA stands for the Spike Video Game Awards, a yearly event that chronicles the best in gaming. This year's show airs December 10. This is obviously in reference to that specific event, in not only the logo but also the price/year (2011). Keep in mind this is a pre-release version of the game, and this ring may or may not make it into the final cut. As for its existence, we're a bit torn. On one hand, this temporarily removed us from the experience. It's a bit odd, considering the game's setting and subject matter. So, what do you think? Cool? Cheesy? No big deal? Let us know.